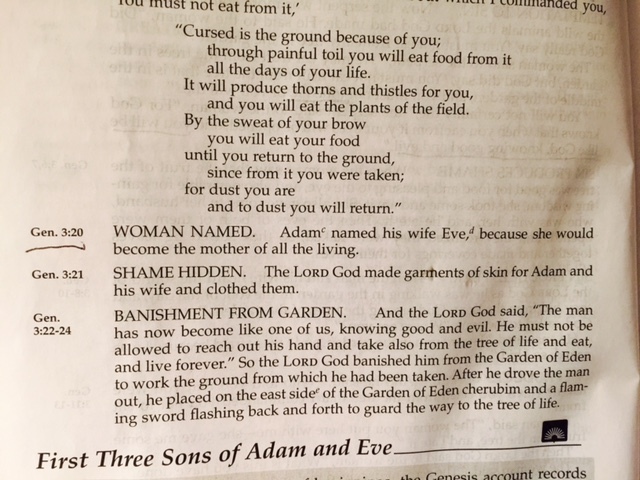 In Genesis 3:20 we read that Adam names his wife Eve. Up to that point, they were both Adam. Male and female. Both parts of Adam. Each part made in God’s image. What a striking picture of what God created marriage to be! They shared the same name because they were 2 parts of the same being. Just like sin creates the marriage issues we see all around us today. We marry the wrong person for the wrong reasons at the wrong time. The grass always looks greener on the other side – because we’re too selfish to fertilize our side. Temporary lusts fueled by sinful pleasures become marriages that fail while hurting everyone involved ……especially the children. Our picture of marriage is so different from what God created it to be. Two bodies making one complete being. Even in today’s world saturated with sin, a marriage like this is still possible if God is in the middle. He promises to work all things out for the good of those who love him. Our marriages are one of those things. He has promised. We just need to trust him. And do our part by obeying. He will always do his part.